The Line 6 range of Tone Core pedals are based on digital modelling, powered by identical DSP engines within the base of the pedal, with a modular, removable control/algorithm section. The two units each offer authentic recreations of vintage effects as well as cleaner-sounding digital versions. The pedals themselves are made of heavy cast metal, and their batteries can be changed without the use of tools by squeezing release buttons on the side of the pedal hinges. DSP engines use a lot of power, so it is more practical to run the units from an external PSU (9V 70mA): Line 6 offer an optional PSU for this purpose. Echo Park offers a maximum delay time of 2.5 seconds and has a tap-tempo function activated by pressing the pedal gently; there's also a manual delay time control, as well as knobs for mix, feedback and modulation depth. By including modulation, you can get some nice chorus-like echoes out of this unit. All the Tone Core pedals have dual input and output jacks to cater for the processing of stereo signals so they are perfectly usable in the studio, even though the effect itself is generated from a mono sum of the two inputs. 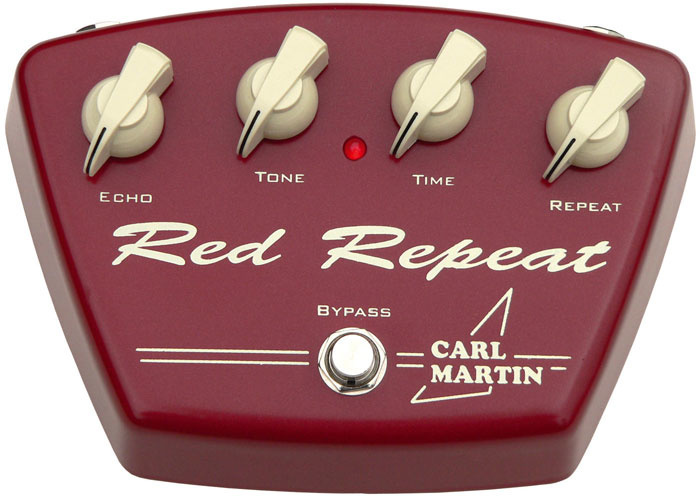 An 11-way rotary control selects from a number of slapback, single-tap and multi-tap echo treatments as well ping-pong delay and the famous Line 6 reverse delay. There's also a ducking delay option, which suppresses the delay level when an input is present. Sweep adds a swept filter effect to the delays, and the Trails switch lets the user decide whether bypass kills the echoes or allows then to fade away naturally. Overall character can be set to Tape, Digital or Analog. A tape-loop delay adds more distortion and noise every time a sound is fed round to create multiple repeats, and the signal loses some high-end. There's also some pitch modulation due to tape wear and imperfections within the tape path, and while these artifacts might be undesirable in theory, they often sound more musical than a perfect digital repeat. Line 6 model these various artifacts with surprising accuracy — you get everything except the tape breaking in the middle of your guitar solo! In the Analog setting, emulating the solid-state, charge-coupled analogue delay pedals that became popular during the 1970s, the sound again becomes 'blurry' but in a quite different way to tape-loop delay, and there are subtle clock noise modulations that have also been emulated here. Although the analogue delay has a rather dull character, it can work very well in a musical context. Echo Park comes so close to capturing the tape loop and analogue delay echo sounds that I think few people would be able to tell the difference, especially in the context of a mix. Liqua-Flange also offers a choice between modern-sounding digital flanging and emulations of classic analogue flangers, the definitive model probably being the original Electro Harmonix Electric Mistress. 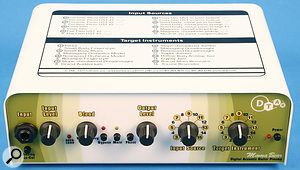 A three position slider sets the character to Digital, Liquid or Analogue, with rotary controls adjusting the speed, feedback, time and depth of the effects. The Liquid switch position brings in a second delay line which slightly delays the 'dry' signal, enabling the flange sweep to pass 'through zero' (in other words, from behind to in front), just as it did in tape flanging when one recorder overtook the other. There's also a smoothed-random step modulation option to avoid the audible cycle of an LFO. Liqua-Flange is the nearest thing I've heard to the Electric Mistress, and though it still doesn't capture the elusive magic of tape flanging, it gets a lot closer than any other pedal I've tried. 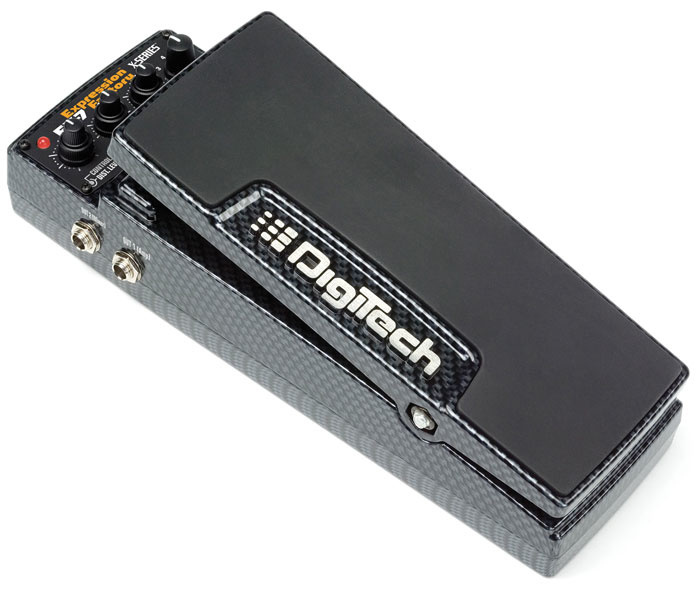 The Digitech EX7 Expression Factory is a new pedal offering a range of wah-wah, whammy and other popular effects. The EX7 is identical in dimensions and control layout to Digitech's Artist Series Jimi Hendrix Experience pedal, reviewed in SOS December 2005 — one knob selects the type of effect and a further three dual-concentric pots adjust effect parameters, and the pedal has separate amp and mixer outputs with on-board cabinet modelling. There are seven different effects, or 'models', to choose from. 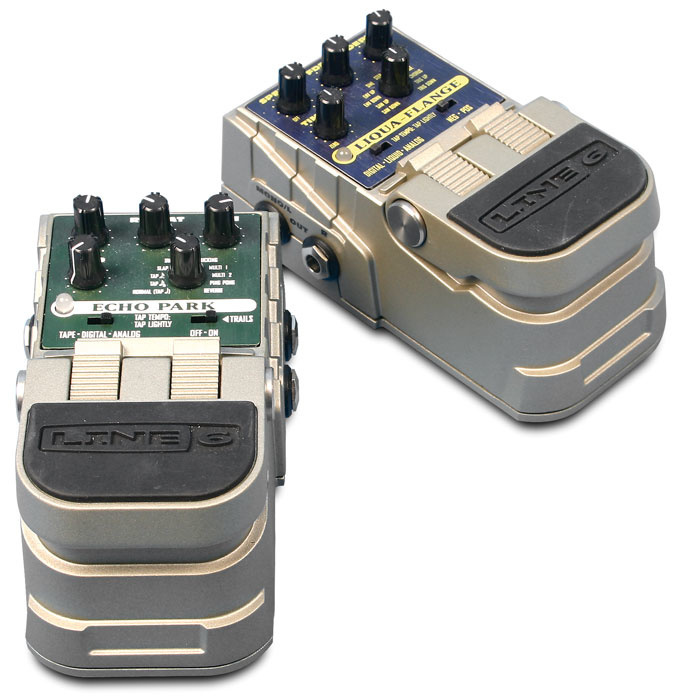 The first two are wah-wah effects, one based on the Dunlop Crybaby and the other on Vox's Clyde McCoy Wah. Models three and four are based on two of Digitech's own effects, namely the XP300 Space Station and the original Whammy pedal. Model five is based on the Unicord Univibe vibrato and chorus effect, model six recreates the sound of a Leslie rotary speaker and, finally, model seven is based on the A/DA Flanger effect. Seven distortion effects culled from Digitech's DF7 accompany the models. The EX7 is out now and costs £229. Danish manufacturers Carl Martin have brought out three new affordable effects pedals based on technology found in some of their existing high-quality effects. The Vintage Series pedals certainly look suitably retro, with their colourful die-cast metal casings and cream chicken-head knobs. 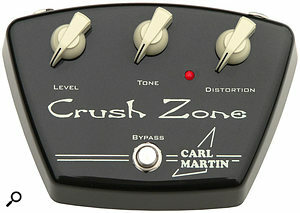 Crush Zone (£49.99) is a high-gain distortion pedal with Level, Tone and Distortion controls. 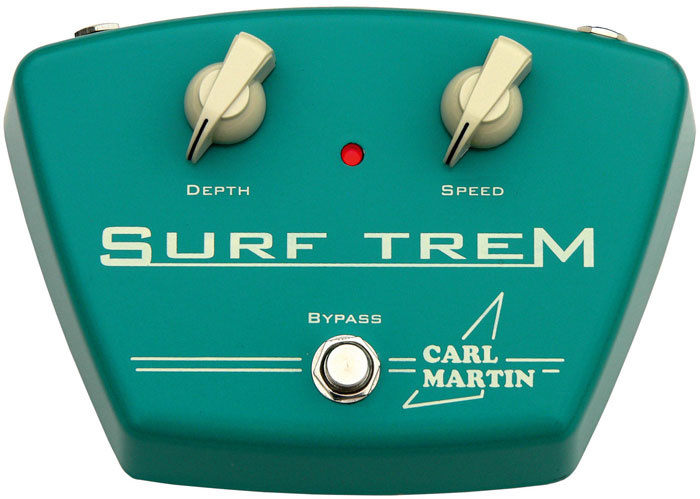 Surf Trem is a simple '50s-style tremolo effect with Depth and Speed controls, employing a circuit taken from Carl Martin's analogue Tremovibe tremolo/vibrato. 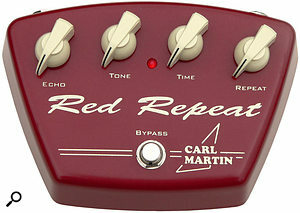 Red Repeat, which is based on the Delayla pedal, provides up to 600ms of delay and an echo circuit capable of analogue-style self-oscillation. All three are available now. First Line +44 (0)1392 493429. Processors such as Fishman's Aura (www.fishmanaura.com) and D-Tar's Mama Bear (www.d-tar.com) can work wonders with brittle-sounding, DI'd acoustic guitar pickup signals in recording situations where you can't use a mic. 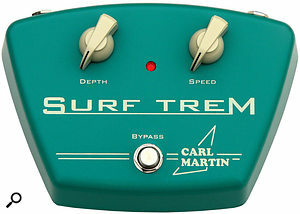 However, it can be difficult to commit to a particular balance between the direct and processed signals at the time of recording, especially if you are playing at the same time as other musicians, as you may often need the more immediate and focused sound of the pickup to dominate over the more diffuse processed sound. However, provided that you also record an unprocessed DI'd signal alongside your processed signal, you can always route it back through the processor and re-record the results, with the luxury of then being able to set the pickup/image balance in the context of the whole mix. 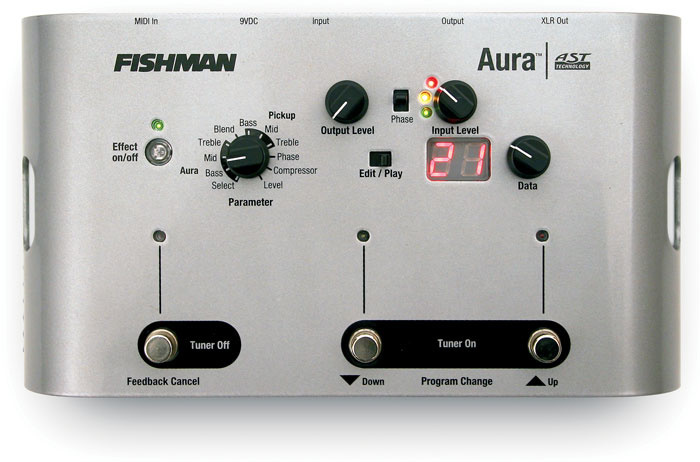 Both the Aura and the Mama Bear are optimised for a pre-amped instrument-level input, so there's no problem sending them a line-level signal and recording the processed output back to another track. There are two strategies available here: one is to monitor the processor's output in the context of the mix in order to set the balance between dry and processed audio. The other is to record a fully processed track with no dry component and maintain the flexibility to tweak the balance right up until the final mix. The latter would seem to have obvious advantages, but there is one more factor you need to bear in mind, namely, the fact that any kind of digital processing incurs a delay. The Aura delays its dry signal to keep it time-aligned with the processed signal, so even if your re-recorded track is a blend of the two, there will be no unwanted cancellations or comb-filtering effects. If you want to keep any of your original dry track in there to maintain your mixing options right to the end, you will have to establish the size of the delay and pull the processed signal back in time with it (the Aura alone adds about 3ms, and the converters in your audio interface will also contribute). The Mama Bear is different in that it doesn't delay the dry signal, but its processed signal is quite different too, and whilst there is a distinct level drop when dry and processed signals are combined equally, there is no really nasty comb filtering. With the Aura, I am often happy to use a 100 percent Aura mix in a recording, whilst, to my ears, Mama Bear always requires a majority of original pickup, with the processed signal just providing a softening 'halo' around it. The Mama Bear signal at 100 percent is way too diffuse and woolly to be useful, in my opinion, but that may be partly what helps it work as part of a non-time-aligned mix. 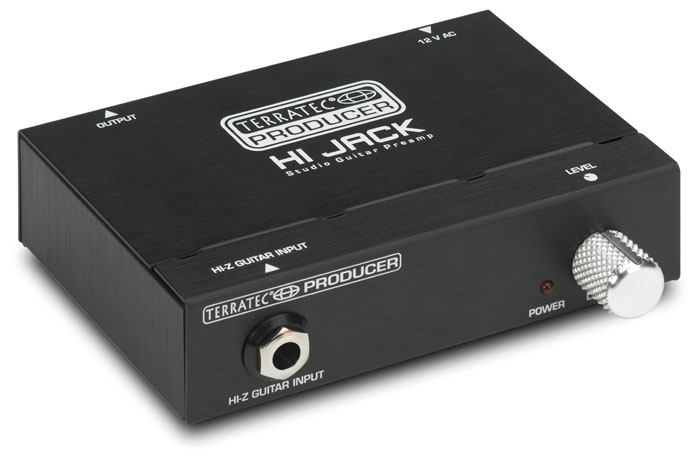 Hi Jack, from the 'Producer' division of Terratec, is a very simple preamp and impedance-matching box for high-impedance electric instruments. 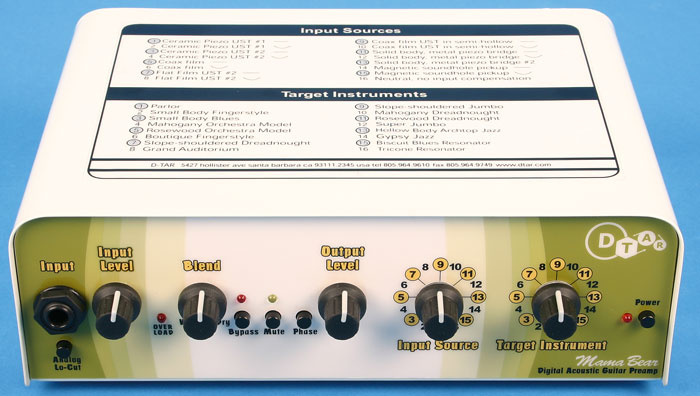 It is ideal for situations where you want to get a clean, unaltered guitar or bass signal into your recording system either for later re-amping or use with amp-modelling software. Electric guitars work best with an input impedance of about 1MΩ (unsurprisingly, the approximate input impedance of most classic valve amp designs), as this ensures that their high-impedance pickups are not excessively 'loaded' by the input stage and that the higher frequencies are transferred intact. Active DI boxes usually offer an impedance of around 1MΩ, and these are fine in this sort of application so long as they are connected to a high-quality, low-noise mic amp. The Hi Jack, however, has up to 40dB of on-board gain available from its discrete FET circuitry, variable via its single control knob, and can therefore plug straight into a line input. The output is a low-impedance, balanced quarter-inch jack with a signal level anywhere between instrument and line level. The all-metal box is powered by an external 12V AC adaptor. Hi Jack's input impedance is actually 2MΩ, although this is not a simple 'higher is better' situation. In fact, there is a complex relationship between the source impedance (the pickups and the volume pot), the input stage and the capacitance of the guitar cable, and if you stray too far from the 'normal' values, things often don't sound quite right. In practice, the Hi Jack's 2MΩ is fine unless you've already got a 'compensating network' on your guitar's volume control to alleviate top loss when you turn it down; then things can start to sound a bit brittle. A switch to drop the input impedance down to 1MΩ would have made a nice addition, but when the Hi Jack is so affordable it hardly seems fair to complain. The Hi Jack is impressively quiet and seems to have ample headroom to cope with any passive instrument output. It imposes no character of its own and the sound doesn't alter with gain level. The only down side is that it weighs nothing at all and if you connect a guitar cable of any substance to it, you are liable to pull it straight off the work surface! The Hi Jack costs £49.